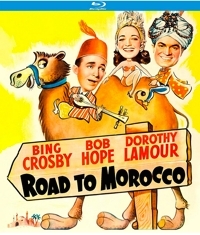 Road to Morocco was released in 1942 following Road to Singapore and Road to Zanzibar, and the third time was the charm. 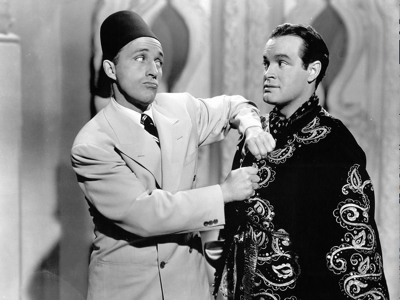 Audiences wanted pleasant diversions from the war, but Morocco was even more fun than usual. It also holds up the best for contemporary audiences—starting with the music. Crosby’s crooning will be either nauseating or amusing to today’s young people, but Hope pokes enough fun of his pal’s singing that it becomes a running gag. And the songs themselves? Starting with the boys having a fun time singing the title song astride a camel, the Jimmy Van Heusen and Johnny Burke tunes are catchy enough to where you’ll find yourself humming some of them days later. Another song that still holds up is the peppy “Ain’t Got a Dime to My Name (Ho Hum),” which Crosby sings after the pair find themselves broke and starving in Morocco and he’s wandering the streets looking for the pal he just sold—though he had no idea what the big burly Arab wanted him for. That’s been the formula of the Road pictures: Crosby sings, Hope cracks jokes, Crosby always shafts his partner, and they both fall for Dorothy Lamour—who always goes for Crosby and sings to him as well. Often the ballads can be yawners, but in this one even those (“Moonlight Becomes You” and “Constantly”) are better than usual. So are the gags—whether it’s Hope lighting a cigarette in the “powder room” of a ship because he thinks it’s a place to freshen up, or a scene in a tent where the boys sabotage an attempt to unite two Arab factions by using the oldest pranks in the book: a whoopee cushion, dribble glass, exploding cigars, and a “hotfoot” treatment. Sometimes 1940s humor doesn’t translate well into today’s PC world, but there are fewer such moments in Road to Morocco. Feminists may not be amused that Hope finds himself pampered by a harem of beautiful women when he discovers he was bought for the purpose of marrying Princess Shalimar (Lamour). And those sensitive to others’ disabilities may cringe at a scene where the boys are starving and watch another man who’s obviously less fortunate mentally. Told that men like him with “dimmed lights” are considered sacred, which is why they’re allowed to take food from vendors, Jeff goads Turkey into pretending to be a “red-blooded American idiot.” Turkey does a cringe-worthy Trump-style imitation . . . but gets his come-uppance when he tries his act on a shopkeeper who speaks the same way and gets angry with him: “Are you saying I talk like an idiot?” There’s a nice mixture of verbal and sight gags in the film that will engage a wide age range of viewers. A bit where the boys are seeing a mirage and sing a song with Lamour will make little ones giggle as the voices are mixed up and each of the three reacts. Like the songs and gags, the plot in this Road pic is also superior. 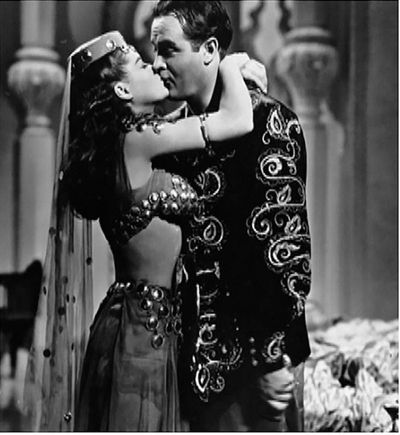 It turns out that Shalimar has been told by a seer that her first husband would die a violent death, so rather than marry the powerful (and easily angered) Sheik Mullay Kasim (Anthony Quinn) as he expects, she schemes to marry Turkey. But while the Jeff-Turkey-Shalimar plays out, one of the harem attendants (Dona Drake) falls for Turkey and tries to warn him. No sags hear . . . except for the camels. And Road to Morocco remains great fun.